The designation of “Actual” exists, and is reserved for the leader of a particular callsign division. No minutes or kilometers—it's mikes and klicks. AC-130s, or Spookys, can literally rain hell from above. For some of us, the extent of our knowledge of the military alphabet comes from Call of Duty and other first-person shooters. While video games are indeed an effective way to learn—I remember becoming a faster typer with the help of the unparalleled Mario Teaches Typing—this is both unbecoming to a gentleman and, honestly, a damn shame. That's not to say learning things from CoD is bad. With the help of my friend Jason Hoffman, a former active-duty Marine who served in the Middle East multiple times, I confirmed that, war is, indeed, hell. 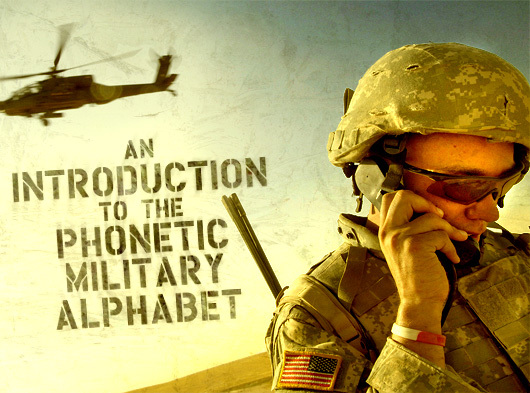 But, out of the kindness of his heart and his vast knowledge of everything—thanks, Hoff!—and with additional readings from field guides and websites for historical details, here is an introduction to the miracle that is the armed forces phonetic alphabet. According to the U.S. Army, the current set of words we use when referring to the military's phonetic alphabet came into use in 1956. The words used prior to 1956 were adopted in 1941. This explains why, in World War II movies and series like Band of Brothers (which you have seen, right? ), we find Able, Baker, and Charlie companies as opposed to Alpha, Bravo, and Charlie companies. But why use these designations in the first place? Let us imagine a scene. You are on your cellphone walking down a sidewalk and you're talking to your boss, Mr. Anderson, explaining why you are late. As a junker rattles by and backfires, what's being said is effectively rendered unintelligible. Now let us imagine that the sidewalk is a dusty street. You are in an infantry outfit. The buildings on either side are blown-out shells. You are on the radio with Sgt. Anderson. The old junker is a truck with a machine gun mounted on its bed. The backfire is, instead, replaced with the report of dozens of 7.62 mm rounds from a PK machine gun flying toward the enemy—or you. You don't have time to repeat yourself. And if you screw up the message, there could be some fatal consequences. While I consider myself a man who enjoys taking the occasional risk, if you can radio in and, well, do anything but shoot back at the enemy, you're a guy with more sand than a lot of us. The main two rules, however: Never say “repeat,” as this tells the artillery to fire again. Instead say “Say again your last.” And No. 2, although the radios are encrypted, never speak in more than 15-second bursts. (If the message takes longer than 15 seconds, wait for two seconds, then speak again.) The 15-second bursts are used just in case radio signals bounce off of something and the enemy channels in inadvertently. Although they use codenames for checkpoints and places on their maps, etc., it's a security measure so that encryption has time to reboot itself and hopefully cut the message short if any hostiles are listening in. While using words with multiple syllables instead of spelling things out may take even a little more precious time, clarification supersedes saving those half seconds to make sure the message gets across clearly. “[Because] there are so many [foxtrot-uniform-charlie-kilo]ing acronyms in the military,” Hoffman says. As for civilian usage, of which Hoffman and I can confirm the hilarity of, the phonetic military alphabet can also be used. Burger King is Bravo Kilo. High definition or the, uh, “unkempt” hair diaper are known as hotel deltas. I am Golf Alpha Alpha (alpha as hell, boys) and he is—well, Hoff is Sarge, Hoffman, Hoff or Echo-Five Hotel. There are also a few uses which may come in handy in seemingly incongruent situations. One, when you have to spell your name out over the phone. Second, if a police officer pulls you over and you're forced to say the alphabet backward (under suspicions of not-so-OK driving). If they still do that, at least. And so, like in those games, you achieve victory. But let me tell you, gents, in real life, the graphics are much better and winning is so much sweeter. Special thanks to Jason, and all the other men and women of the Armed Forces for doing what most never could. I have saved lives with the phonetic alphabet and proper RT. And it has saved me. Great article! Bryan, Nick, thanks for your comment! Every time I hear someone say “Repeat” instead of “Say Again” I brace for impact. And all this time, I thought the lady who shares a cube wall with me was talking about some dude named Victor everyday.